From Heidi MacDonald comes the news that Batman, according to one scholar, exemplifies the Jewish ideals of struggle and self-sacrifice. I don’t have a lot to say about this, primarily as I am not intimately familiar with the Jewish ideal of struggle. But also because, well, it’s not really news; it’s angle. I quibble with the concept of “angle” in news, as I worry that stories are published, not because they have useful information, but because they have a cute hook. And that informative pieces are skewed by the need to sidle into the story through the angle. I remember reading, many years ago, a newspaper article about a blind lawyer. The article was confused as to whether it was a profile of an individual overcoming adversity, a portrait of the technology that enabled him to operate on an equal level with his sighted colleagues, or the fact that he viewed himself as a “crime-fighter” and sent his vanquished foes photocopies of his license with the name “Batman” over his name. The last bit? All angle. It gives the profile an edge to keep the reader beyond the headline, a way of getting them into the story. He’s not just a lawyer, he sees himself as a Force for Justice. In the comics press, the angle would be that a blind lawyer identified with Batman and not Daredevil. And if the article hadn’t pre-dated the Ben Affleck film, the mainstream press article could have used that angle as well. 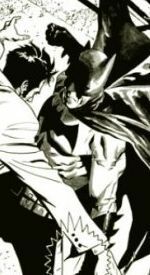 Regardless, the mere fact of Cary Friedman’s writing wouldn’t have had sufficient oomph to catch the eye of editors and readers without the Batman aspect, the Batman angle. And while the obvious question is, “Yes, but it is news?”, I posit two alternate queries: a) Sure, Batman’s Jewish. What isn’t Batman? He’s everything. b) Of course he’s Jewish. What superhero isn’t representative of some Jewish ideal? Superheroes representing religion came forefront in the public consciousness when Bryan Singer has Superman crucify himself for the sins of humanity in this summer’s Superman Returns. Many people were dissatisfied with the whole Superman = Christ imagery, but it didn’t bother me, as I felt it was portrayed with more grace and dignity than the doves and halos that tend to populate every John Woo flick. Also, I had always associated Superman with religion since listening to Michael Shapiro speak on NPR about the 100 most influential Jews of all time, a list that began with Moses and ended with Jerry Siegel and Joe Shuster, creators of the extraterrestrial boy in blue. And since a great many superhero creators were Jewish, so I naturally associated Superman more with Moses than Jesus, but it’s difficult for Americans not to find or make Christ parallels in anything, given enough time, and Superman’s had an awful long time to slowly morph from his original intent to the pure American boy scout he is today. Batman, though? Sure, he might represent the mantle of personal suffering, and maybe he does sacrifice his own happiness to help “repair the world”, but I’ve always associated Batman more with Catholicism than with Judaism. Probably because of the classic jokes, but also because of the pervasive crucifixes used in scenes where Bruce Wayne visits his parents’ graves. Adherents.com, a website dedicated to the cataloguing of information about religious beliefs, notes that former Batman writer and editor Elliot S! Maggin always considered Batman to be Episcopalian, and I consider that to be the final word on the matter — particularly since the Episcopalians are more tolerant of homosexuality.